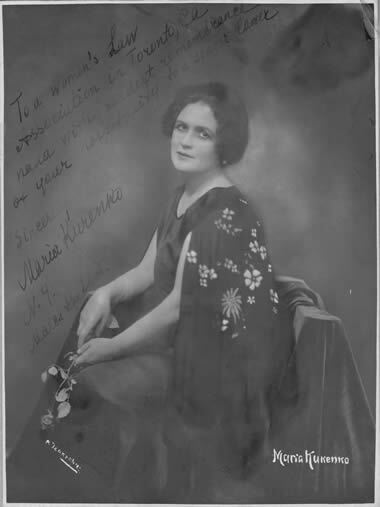 Sometime in the mid-1920s, Russian soprano Maria Kurenko paid a visit to Toronto. Kurenko was guest of honor at a luncheon hosted by the Women’s Law Association of Ontario at the King Edward Hotel. Kurenko, who had received a law degree at the University of Moscow, later sent the association an autographed photograph from New York. The inscription on the photograph reads: "To a Women’s Law Association in Toronto, Canada with kindest remembrance of your hospitality to a singer lawer [sic]. Sincerely, Maria Kurenko, N.Y., March the 28th."